The cost of living is in the news in the UK but it always is, in one or other of its ubiquitous, chameleon guises; and no less chameleon are the means for measuring that essential but quicksilver property of the commonweal, sometimes called by a less fetching name: inflation. I get .758, a high association by social-scientific expectations, but one clearly ridden by a measure of slack between the two fields. 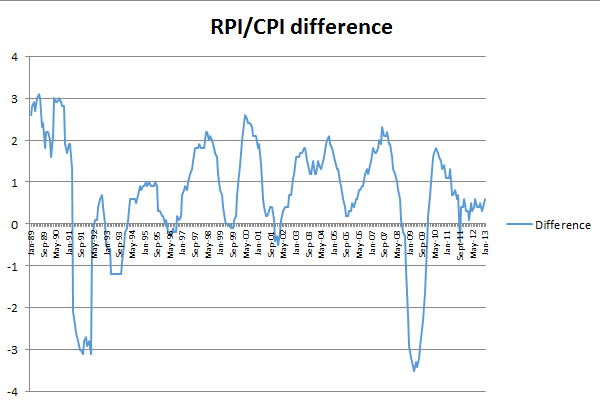 But again, RPI and CPI aren’t measuring precisely the same thing. Both ranges (or arrays, to use the technical term) pull up here at row 774, as they must submit the same number of records. Result: .235, a moderate positive association between Retail Prices as operationalized here and Weekly pay. Result here: a notable, but deceptive, -.338. 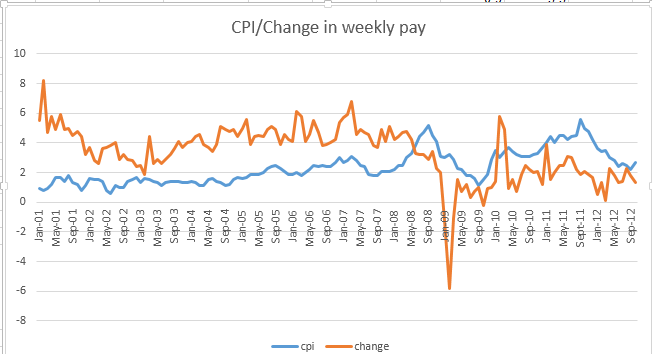 There was, as we see here, a stretch of months in 2009 when the RPI actually fell beneath the CPI. 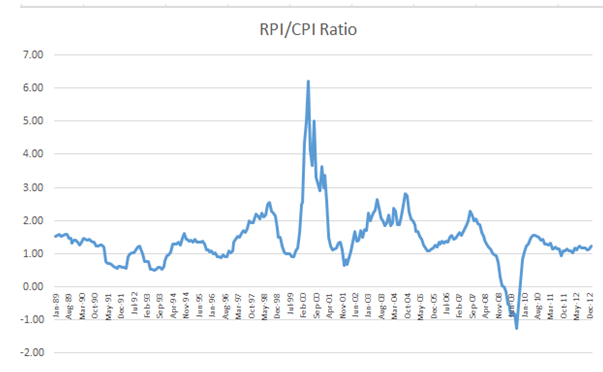 “Between 1989 and 2011 Retail Prices Index (RPI) inflation tended to be around 0.7 percentage points higher than Consumer Prices Index (CPI) inflation on average.” (Extracted from the document hyperlinked above). Maybe so, but the constituents of that average run riot across the years. OK – But I’ve remained eyebrow-raisingly silent about the Date column and those green-notches commanding many – but not all of its cells. Some formatting issues in there? For sure. Not to worry, though; I’ve got you in mind – in Part 2. Be there – aloha.